Deacon Frost is a Marvel villain. He is a ambitious vampire with a unique power that gives him an equal footing to confront.both heroes and other supernatural baddies. Frost has the ability to create doppelgangers of those he bites which allows him to create armies quickly. Frost killed the mother of the vampire hunter Blade and in doing so gave Blade the vampiric enzymes from which his powers originated. He is one of Blades most reoccurring villains, and has been killed and resurrected many times. 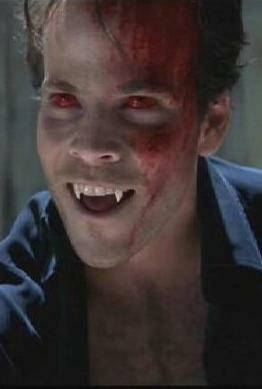 Deacon Frost appeared in the film Blade as its main antagonist. He was played by the actor Stephen Dorph. The comic version of the character appears dramatically different than the Stephen Dorph version. The comic version appears as a middle aged, white haired, man as opposed to the young, boyish Stephen Dorph movie version. The movie version also does not have the doppelganger making power of the comic version. Both vampires are ambitious and irreverent of the power structures they face. The Deacon Frost in the films seeks the means of overcoming the older vampires of his world. The comic version challenges Dracula for control of the world's vampires. Deacon Frost is a scientist (Perhaps an alchemist) searching for a means of becoming immortal. In one of his experiments he plans to inject vampire blood into a captured woman. As he goes to inject the woman her fiance burst into his laboratory. The two men fight and during this scuffle Deacon Frost himself is injected with the blood. He turns into a vampire and he soon learns that in addition to the other vampire powers he has added power due to his unique origins. A subjugate doppelganger is created of anyone he bites. The power also works when he bites the doppelgangers themselves allowing him to create massive armies of doppelgangers. The ambitious Frost uses this power to rise up the vampire power-structure and even challenge the vampire lord Dracula. The power also allows him to deal with formidable vampire slayers and heroes. Deacon Frost is responsible for the creation of two world's foremost vampire slayers, Blade and Hannibal King. While in London, Deacon came across a pregnant prostitute nearing the time of giving birth. He sees the woman as easy prey. He lies to the woman and tells her that he is a doctor. As she is giving birth he strikes, killing her. Unbeknownst to him his vampiric enzymes are transferred to the baby. The baby grows up to become the vampire hunter Blade who hates Frost with a deep passion. Hannibal King was attacked and turned into a vampire by Deacon Frost. He hates him for this. Hannibal King and Blade united to take down Frost. They stabbed him numerous times and left him to die as his lair exploded. There is an imposter Deacon Frost who turns out to be a deranged doppelganger. He is attacked by Blade and ends up being killed by a demon that he summoned. In New Orleans, Frost and the Voodoo priestess Marie Laveau joined forces to create an army of zombies but they were thwarted by Brother Voodoo and Blade. Dracula called up Frost to serve as a body guard as he went through a magical trial. After the trial ended Blade staked him again. Doppelganger creation ability. Due to Frost unique way of becoming a vampire he has the ability of creating a subjugate doppelganger of anyone he bites. He has used the ability to create armies of Blades for example. He can also make doppelgangers of the doppelgangers, so he can create hordes of soldiers without any seeming limit. Deacon Frost has life teams worth of experience. He is a skilled fighter, general and is considered to have a genius level intellect. No appearances yet but Deacon Frost did appear in the film Blade as its main antagonist. He was played by the actor Stephen Dorph. As of yet it is not clear if Marvel will take parts of the old Blade trilogy and add them into its MCU continuity.